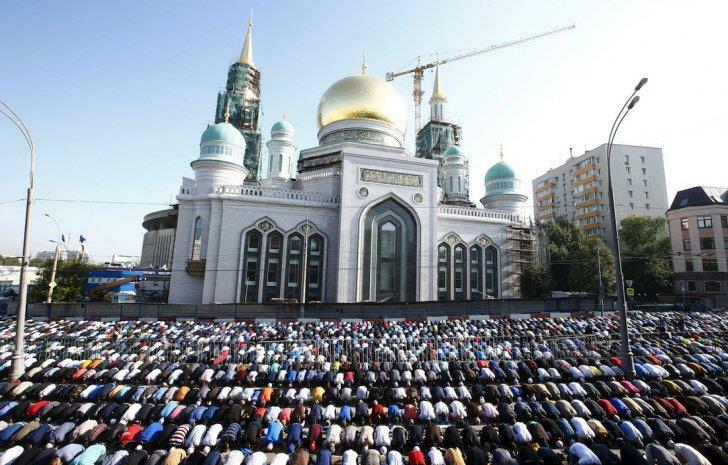 JNN 25 July 2015 Moscow : Though turning more hostile to Muslims, Moscow has witnessed major `Eid Al-Fitr prayer in which more than 60,000 gathered for prayers at the golden-domed Sobornaya mosque despite the bewildered and scared faces of passersby and baton-wielding police officers around them. They bent, knelt, and prostrated in front of the golden-domed Sobornaya mosque in Moscow’s main square and five temporarily blocked streets. An additional 180,000 gathering at five other mosques and three dozen temporary sites in Moscow and the greater Moscow region, to mark the end of this year’s holy month of Ramadan, police said. Nevertheless, some Muscovites appeared unhappy about the scene, though the prayer was held in the early hours of the day. In Moscow, Muslims, either Russian-born or immigrant, secular or practicing, don’t feel welcome. With only six mosques in the large city, attempts to build new ones have been met with protests and rallies. Despite the large number of Muslim population in the city, there are only a handful of Muslim kindergartens or schools. “They are far to get to and there are too few of them,” Jannat Babakhanova of Limpopo, a small network of Muslim kindergartens, told Al Jazeera. Muslims form the fastest growing and most ethnically diverse sector of Moscow’s population. With an official population of 12.5 million, Russia’s capital is now home to at least 1.5 million Muslims, according to political analyst Alexei Malashenko. The presence of Muslims in Moscow prompted large number of reverts to Islam among ethnic Russians. This entry was posted in Europe and tagged Golden Dome Mosque, Moscow, muslim population. Bookmark the permalink.